What a face since day one. Zinnia is a sweet beautiful, medium fawn alpaca with a very rare bloodline and fleece that is extremely fine and uniform throughout. Ribbons include 1st Place 2014 STA Hummdinger - Fleece. 1st Place 2013 American Fiber Rally - Fleece. 2nd Place 2013 Green Mountain Fall Spectacular - Fleece and 3rd Place 2012 American Fiber Rally – Fleece. 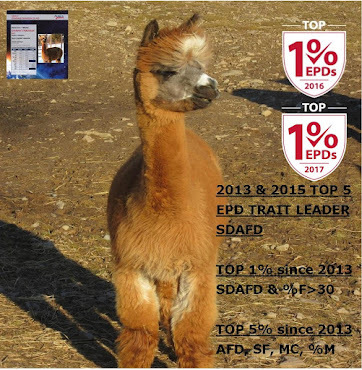 Zinnia has consistently placed in the Top 1 - 15% on AOA's EPD Trait Leaders reports since 2013. 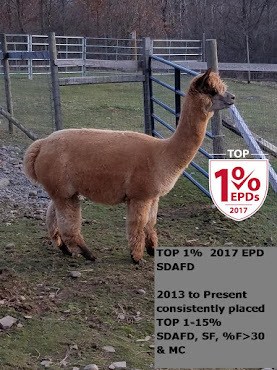 Zinnia's dam is our girl, Gianna's Peruvian Ivy, who in 2013, at age 7 was named one of AOA's Top 5 EPD Trait Leaders for SDAFD and was in the top 1 % for the traits %F>30 and MC and the Top 10% for the traits AFD, SF and SDMC. 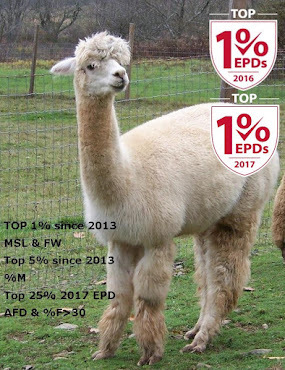 In 2014, at age 8, she missed being in the Top 5 for SDAFD by 1 - she was #6 - but was in the Top 1% for SDAFD, %F>30 and MC and again in the Top 10% AFD, SF, SDMC and %M and at age 9 in 2015 had again been named a Top 5 Trait Leader for SDAFD, and continued to be in the Top 1% for %F>30; and the Top 10% for AFD, MC, SF & %M. At the age of 11 she continues to place in the Top 1% for SDAFD & %F>30 and the Top 5% for AFD, SF, MC and %M. As of 2017 her micron count was 24.4. Zinnia's sire is PHA Accoyo Zagot, also with rare genetics; he is a medium fawn full Accoyo which is rare enough. He is the last in his maternal bloodline, His dam died when Zagot was only 2 months old. 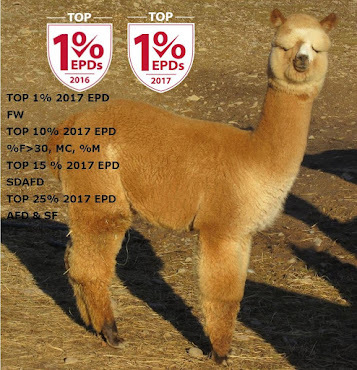 His sire, El Nino recently died so Zagot's heritage can not be duplicated, he is 1 of only 4 fawn full accoyos that El Nino produced. 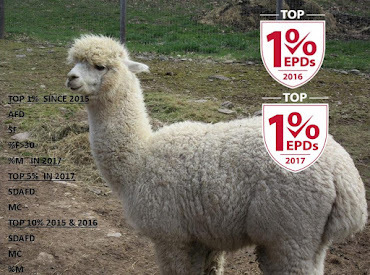 Zagot has earned a color championship as well as blue ribbons in both halter and fleece. 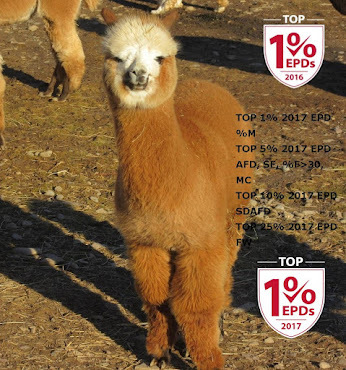 We bred Zinnia to Accoyo Cuba Libre, a 5X Ribbon winner and whose genetics are rare and known for producing elite offspring for her 2014 cria. This was Zinnias first cria and we were very excited for her. 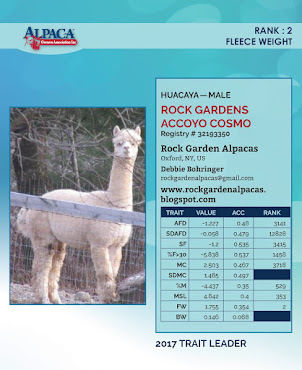 They produced a beautiful black girl we named Rock Garden Alpacas Perucoyo Petunia. 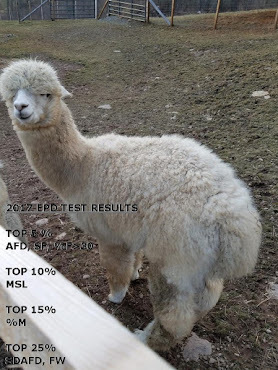 Petunia's fiber is extremely long, fine and crimpy and took 3rd Place at the 2016 AOA Nationals Fleece Show. In 2014 we bred Zinnia to our herdsire, Rock Gardens Accoyo Cosmo who has once again been named one of AOA's Top 5 EPD Trait Leaders for 2017 in fleece weight and will be featured in their presentation during the Alpaca Owners Association National Show and Auction in 2018; this is his third year in a row. He has consistently been in the Top 1-15% for AFD, SF, %F>30, and %M, MSL & FW since 2013. Cosmo's dam is our girl Alpavo's Accoyo Sunflower Girl who also has extremely impressive genetics. Zinnia at 1 month old. Still a beautiful face. With fleece as beautiful as she is at 2 1/2 months.